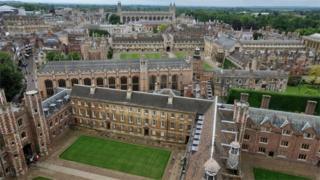 Cambridge University Press, the world's oldest publishing house, has reversed a decision to censor content in China. The publisher had agreed to suppress access to hundreds of its own articles that dealt with subjects sensitive to the Chinese authorities, such as those about the Tiananmen Square massacre. The Chinese had said that if CUP did not censor content, it would not be able to publish other material in China. It changed its mind after protests. In a petition published on Monday, academics from around the world spoke out against what they called China's attempts to "export its censorship on topics that do not fit its preferred narrative". Tim Pringle, editor of The China Quarterly, whose articles were blocked, welcomed the reversal. "Access to published materials of the highest quality is a core component of scholarly research," he said. "It is not the role of respected global publishing houses such as CUP to hinder such access." The Chinese had told the CUP to block access to more than 300 articles from The China Quarterly as a price for being allowed to publish other material. It said at the time of the initial announcement on Friday: "We can confirm that we received an instruction from a Chinese import agency to block individual articles from The China Quarterly within China. "We complied with this initial request to remove individual articles, to ensure that other academic and educational materials we publish remain available to researchers and educators in this market." Dr Pringle told the BBC that CUP's initial willingness to take down the articles in question indicated "a deeper underlying issue around the contradiction between academic freedom and the allure of the Chinese market. "As the editor of the leading China studies journal, we'd obviously put academic freedom above all other considerations which isn't to underestimate the difficult position CUP found themselves in." He said CUP had informed him the articles would be reposted immediately.